The 2017 Howard Vineyard Shiraz was the SA Drink Of The Week for episode 268 of The Adelaide Show podcast. Guest, Trent Mader, had just been to Howard Vineyard at Nairne a few days before recording and we thought the young Shiraz would be just what was need to spur us into our discussion about walking pilgrimages around the world. Of course, Howard Vineyard winemaker, Tom Northcott, has been a guest on the podcast before, when we got together with Dougal McFuzzlebutt and Ivan Tomic, to make the A Night At The Manchen episode. As it happens, Howard Vineyard had two weddings booked on the day of recording, and that made it’s way into the tasting. And there’s also some stories about how the French mistreated Australian winemakers at a major tasting event, along with the origin of fancy back label stories. PS The picture is of Trent pouring the wine and we were so enthralled by it, we forgot to take our standard, label-front picture. Sorry. One of the first things Steve commented on was the nose. He asked Trent, have you ever walked into a winery’s large cellar of barrels and caught the heavy, heady, wood, earth, and spirit aromas in such cool, dark places? Trent had and he said that was spot on as a descriptor for this wine. On the palate, Steve said it was like he was squeezed into an overcrowded wedding at Howard Vineyard, but one where you are tightly packed between blackcurrents. Then he added, with a little ginger circling the room occasionally. 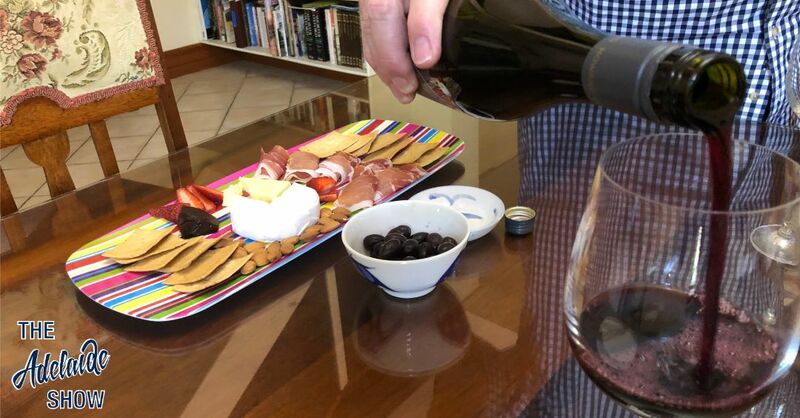 In essence, we not only recommend the 2017 Howard Vineyard Shiraz but we also recommend listening to the live tasting because no notes here could do it justice. You can play it using the player below, or by searching for The Adelaide 268 in your favourite podcast app.